You will earn 14,523 Reward Points. Earn 1 reward point for every 1 dollar spent. 1⁄2 H.P. two speed oven blower-motor. Oven cool switch for rapid cool down per section. 480V/60 Hz/1 or 3 phase. Stainless steel rear motor enclosure. 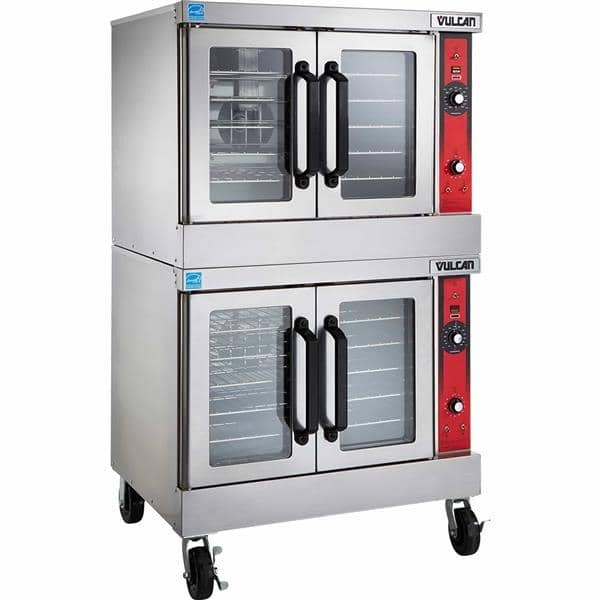 Double section, deep depth electric convection oven, VulcanHart Model No. (VC66ED) (VC66EC). Stainless steel front, sides, top and legs. Independently operated stainless steel doors with double pane windows. Non-sag insulation applied to the top, rear, sides, bottom and doors. Porcelain enamel on steel oven interiors measure 29"w x 26 1⁄8"d x 20"h. Two interior oven lights per section. Five nickel plated oven racks per section measure 28 1⁄4" x 24 1⁄2". Eleven position nickel plated rack guides with positive rack stops per section. Each section heated by electric solid sheath elements rated at 12 KW. Furnished with a two speed 1⁄2 H.P. oven blower motor per section. Oven cool switch for rapid cool down. 208 or 240 volt, 60 Hz, 1 or 3 phase. NSF listed. UL listed. UL listed to Canadian safety standards. One year limited parts and labor warranty. 1 / 2 H.P. two speed oven blower-motor. Oven cool switch for rapid cool down per section. Stainless steel front, sides, top and legs. Independently operated stainless steel doors with double pane windows. Five nickel plated oven racks with eleven rack positions Model VC66ED per section. 25 total KW. Moisture vent damper control. Porcelain enamel on steel oven interiors.